At Booth Movers we understand how stressful it can be to complete a residential move, so our expert team is here to help! Since 1945, our New Jersey residential movers have been committed to providing every customer with a moving experience that exceeds their expectations. Our award-winning Bergen County residential moving company is an accredited ProMover affiliate of the American Moving & Storage Association and a board member of the New Jersey Warehousemen and Movers Association, demonstrating our commitment to professionalism and quality service. Built upon the principles of honesty, integrity, and value, our New Jersey residential moving company leads the industry in providing the highest-quality moving services at a price that can’t be beat. Whether you are moving to the other side of town or across the country, our Bergen County residential movers have the ability to handle both small and large-scale residential relocations. Booth Movers is a trusted agent of Atlas Van Lines, and this affiliation gives us access to the equipment and professional support needed to make any residential relocation a seamless, stress-free process. Wherever life takes you, there is no better choice than Booth Movers to take the stress out of your next relocation! We start the process with a free, in-home professional estimate from one of our experienced New Jersey residential movers to help you determine moving costs. From there, our expert customer service team will help you navigate every stage of your residential move. From start to finish, our New Jersey residential moving company will take the stress out of your household relocation! Local Moving – When it comes to Bergen County residential moving services, nobody knows the area better than our team of moving professionals! Long Distance Moving – As the premier choice among New Jersey residential moving companies, Booth Movers can handle all the details of your long distance relocation. Interstate Moving – When moving to a new state, you need a quality moving company on your side to ensure a seamless process. International Moving –Customs clearance, full-service packing, crating – you name it! Booth Movers has the expertise to help you with all aspects of your international move. Full Service Moving – Whether you need furniture disassembled or your antiques carefully crated, our full-service moving company can get the job done. 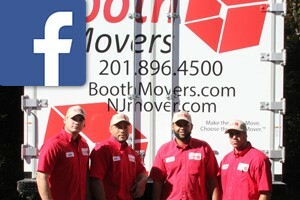 Are you interested in learning more about New Jersey’s first choice among residential movers? Give Booth Movers a call or fill out our online form today! One of our friendly staff members will answer all of your questions and help you set up a free, no-obligation moving estimate!